Will small commercial vans deliver bigger payloads for automakers? The van market is slowly changing. The Ford Transit Connect is the first to test new waters, determining whether there's a big market for a small commercial van. Dodge and Nissan are eyeing this market, too. But is everyone overestimating this market? Ford's Transit Connect is compact in size, front-drive and seemingly perfect for pickup and delivery, especially in major urban markets like New York City or Chicago. These are cities where traffic is difficult to maneuver throughout the day and parking is nearly impossible to find. 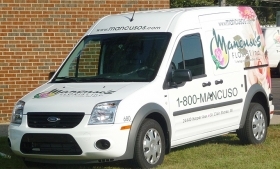 For some businesses in this environment, a compact van is the perfect vehicle. Ford is also touting the Transit Connect as a taxicab. The Ford Crown Victoria, popular with cops and cabbies, ends production sometime next year. Behind the Transit Connect's second-row seat, there's still loads of space, perfect for carrying a family's suitcases. Ford is covering all bases, offering Transit Connects that operate on compressed natural gas and propane. A pure electric battery offering is planned, too. Of course, Ford won't have this segment to itself. In the next several years, Dodge and Nissan will offer similar-sized vans for the U.S. market. Dodge's van will be based on a Fiat model. Nissan's will evolve from a Renault product. Although no details have been released by either automaker, the expectation is that they will be targeting the same buyers as Ford. But, I wonder if the three automakers are overestimating the U.S. market for compact vans? Through September, Ford has sold 19,244 Transit Connects. That averages to about 2,140 per month. If that trend continues, that could be 25,680 for the year. Not a big sales number. Will the Transit Connect find a much bigger customer base once the economy turns? Of course, small businesses, big businesses and every business in between are delaying the purchase of some vehicles until the economy picks up. That's why the Transit Connect's sales are on the light side. However, once the economy swings back, the question is, how may compact vans can be sold annually? 50,000 vans? 75,000? Will this be a huge market? No. A 100,000-unit segment is unlikely -- that's my prediction. Taxi sales are a drop in the bucket -- maybe 4,000, 5,000 annually, I've heard. The biggest drawback for any compact van is front-wheel drive. The cargo sits on the trailing wheels, not the wheels that supply power to the vehicle, as in rear-wheel drive. It's a traction issue. Ford caps the Transit Connect's payload capacity at 1,600 pounds, which is hefty but not ideal for every commercial application. Dodge and Nissan likely will have similar limitations. Once Dodge and Nissan introduce their vehicles, it will be interesting to see how the three duke it out, which compact van is top dog. My bet is aggressive fleet incentives will determine the winner.